In clinical studies, the Pure-Vu® System was demonstrated to be safe and effective in cleaning inadequately prepared colons to an adequate level for a thorough exam. Patients were given a pre-procedural preparation consisting of only an 18-24 hour liquid diet and 4 bisacodyl/laxadin tablets (Dulcolax) to purposely create inadequately prepped colons. No traditional purgative was given. 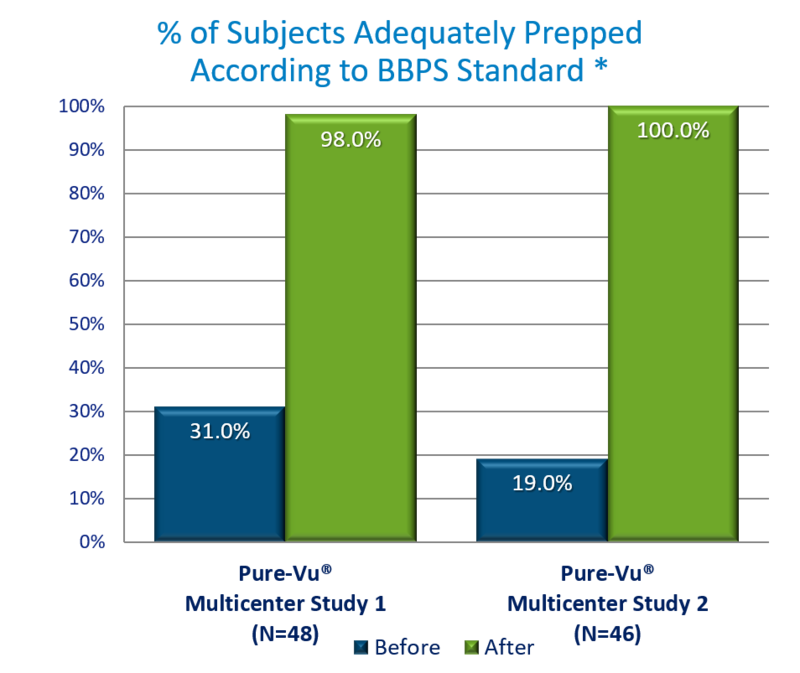 The Pure-Vu® System significantly increased the number of subjects with an adequate cleansing level (BBPS ≥ 2 in each colon segment) from 31% at baseline to 98% after use of the Pure-Vu® System (p<0.001). Physicians were satisfied with the device's general ease of use. No major difficulties were experienced when performing polypectomy. No serious adverse events were reported.